PORTLAND, Ore. – December 2, 2015 – It’s National Pear Month and the perfect time to enjoy juicy, sweet pears. If that isn’t reason enough to fill your shopping basket, there’s another reason to add this fruit to your grocery list. A new study, “Fresh Pear Consumption is Associated with Better Nutrient Intake, Diet Quality, and Weight Parameters in Adults: National Health and Nutrition Examination Survey 2001-2010,” published in Nutrition and Food Science, revealed new information regarding the health benefits of pear consumption.1 Of particular interest given the high rates of obesity in the United States, the study found that adult pear consumers had a lower body weight than non-pear consumers and they were 35 percent less likely to be obese. The epidemiologic study, led by Carol O’Neil of the Louisiana State University Agricultural Center, used a nationally representative analytic sample to examine the association of fresh pear consumption with nutrient intake, nutrient adequacy, diet quality, and cardiovascular risk factors in adults. The USA Pear Bureau continues to collaborate with researchers to commission additional studies that show the relationship between pears and positive health outcomes. 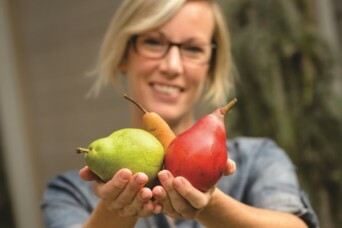 Visit www.usapears.org for additional pear research, nutrition resources and recipes. The Pear Bureau Northwest was established in 1931 as a nonprofit marketing organization to promote the fresh pears grown in Oregon and Washington. Today, the United States is the third largest pear-producing country in the world, and Oregon and Washington comprise the nation’s largest pear growing region with 1,600 growers producing 84% of all fresh pears grown in the United States. Pears grown in these two Pacific Northwest states are distributed under the “USA Pears” brand. Pears are an excellent source of fiber (24% DV) and a good source of vitamin C (10% DV) for only 100 calories per medium sized pear. Sweet and juicy with no fat, no sodium, and no cholesterol, pears are a perfect choice for a snack as well as for any course of any meal of the day. For more information, visit www.usapears.org, www.facebook.com/USApears, and follow @USApears on Twitter.